Click on Admin » Devices » Add Device to load the Add Device dialog. Switch to the IP & SNMP tab. 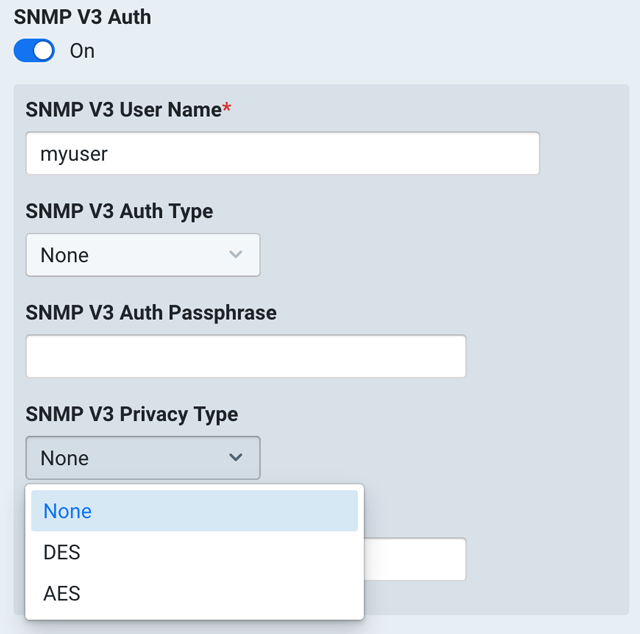 For more information on configuring SNMPv3 authentication, check out our Knowledge Base article. 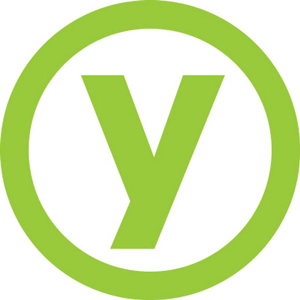 The latest in our ongoing efforts to ensure the security and privacy of our customers’ data, is support for two-factor authentication (2FA) using a hardware YubiKey. 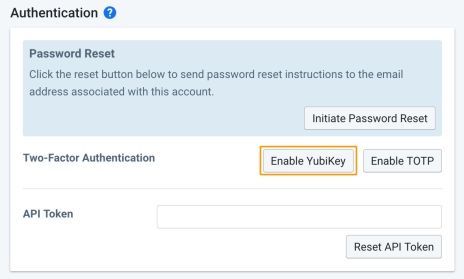 This new user authentication method can be enabled by clicking on your name in the upper right-hand corner, selecting My Profile and clicking the Enable YubiKey button in the Authentication section of the My Profile dialog. This will bring up the Register YubiKey dialog. Touch your YubiKey to fill the pane with a code and click on Finish Registration. You are now setup to start using your hardware key as an authentication method. As regular users of Kentik Detect may have already discovered, we gave the Device List table on the Devices page (Admin » Devices) a makeover. We have added a button at the top that can be used to toggle between Device Stats and Device Details views. The information on the Device Stats view remains the same, although better organized. On the Device Details view we have added Interface Classification, CDN Attribution (shows a check if the device is configured to participate in CDN Attribution feeds), and Plan & Site to give the user more details about the device at a quick glance. For more information about the redesigned Device List views, check out our KB article. UI Set Sampling Rate: Up until now, you had to set the sampling rate with a CLI parameter. Now, if the sampling rate parameter is not set, kprobe will determine the sampling rate by communicating with the Kentik Data Engine to receive the value set in the portal. This allows a more standard deployment of the agent where varying sampling rates may be required across the environment. 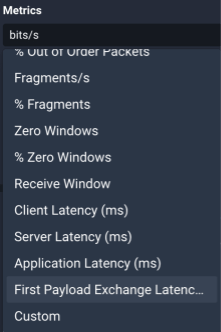 First Payload Exchange Latency (FPEX) metric: This new metric measures application response time. After the TCP session is setup, this measures the time between the first request packet and the first response packet. This is especially useful for applications which Kentik cannot decode (HTTP and DNS are currently decoded). You will find this new metric in the Metrics drop-down menu in the Query pane of the Data Explorer sidebar (Data Explorer » Explorer View). It can also be used in Multi-Metric mode by click on Customize Metrics in the Query pane. You will find the FPEX metric at the very bottom right-hand corner of the Metrics dialog. This metric is also available in the Alert section of Kentik Detect. For more details on using the Alerting system, check out our KB article or Alerting Blog. The first two settings can be evaluated as AND or OR operations by changing the selector between them. The final setting is always evaluated as an AND operation. Static: This method uses a static, plain-text provider name for interfaces that match. To use this configuration on an existing rule, click on the rule within Interface Classification and fill in the Provider text field in the Then pane. 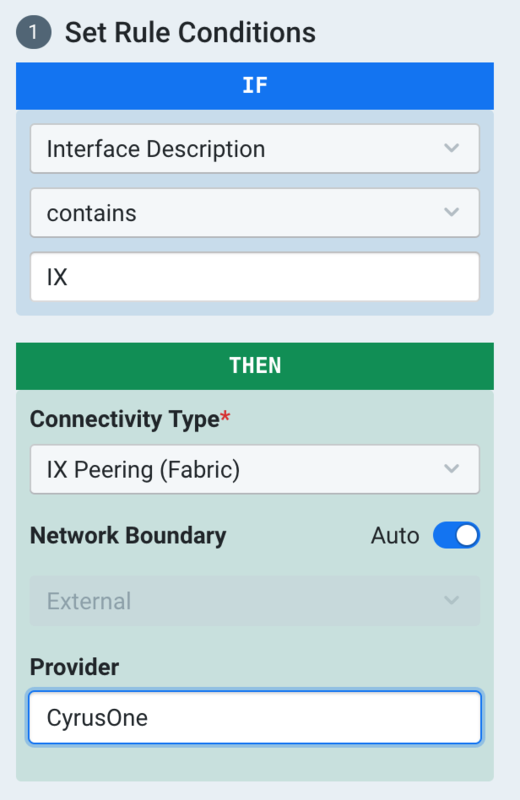 In the pictured example, we are matching on “IX” in our interfaces description and setting the provider for any of these interfaces to “cyrusone” (NOTE: provider names are converted to all lowercase to avoid duplications). 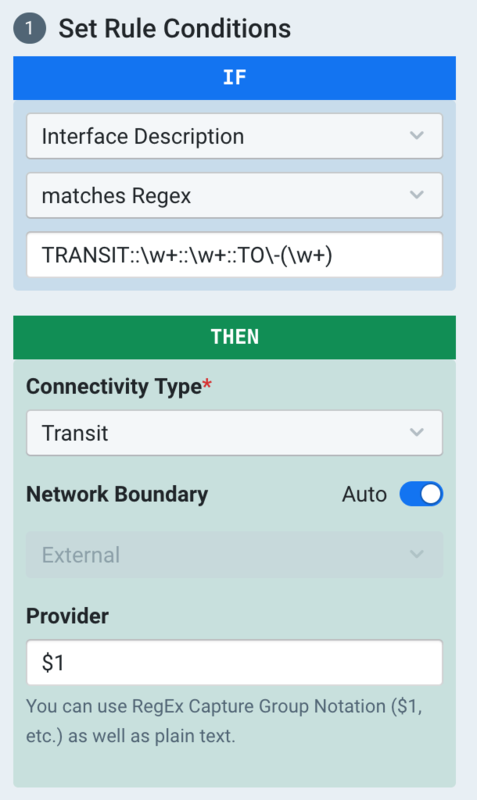 Regular Expression (RegEx): For more complex matching and classification, we support RegEx Capture Group Notation. This method allows for matching using RegEx and extracting the provider name using the RegEx Capture Group Notation. In the pictured example, our group is extracting the word that comes after “TO-” and using that ($1 refers to the first group extracted) as our provider name. If you need a refresher on RegEx Capture Group Notation check out this helpful guide. If you need help testing your RegEx syntax, check out this useful application. Once you are happy with your RegEx configuration, click on the Test Rule button to see what is matching. 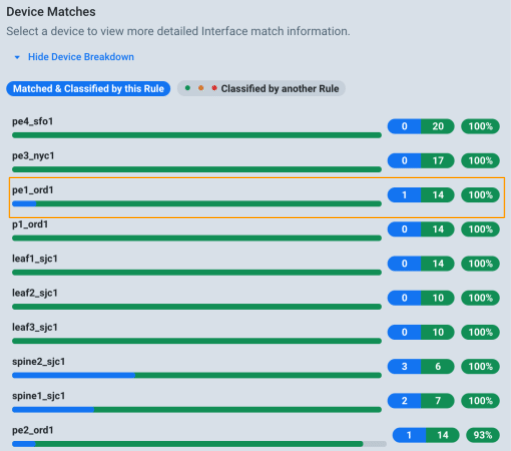 You should get a list of Device Matches list the one pictured. The rows with blue in the bar and a non-zero number in the blue background have interfaces that were matched by the tested rule. Click on one of those rows (e.g. pe1_ord1) and you can see what interfaces matched and what provider was pulled out of the interface description. To exit this screen and return to your rule, click the X in the upper right-hand corner. For more information on Provider Classification, be sure to check out our KB article. 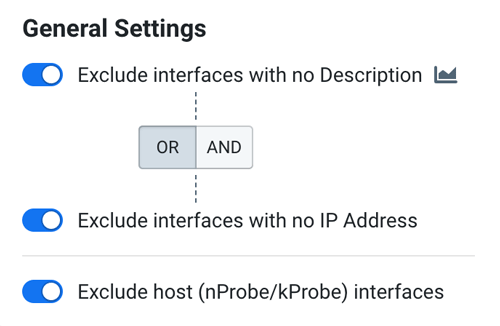 Speaking of Interface Classification (IC), we made it even easier to find which interfaces in your account are not being classified based on your existing rules. In the Classified Devices pane on the right side of the Interface Classification screen (Admin » Interface Classification) you will now see a View X Unclassified Interfaces button like the one highlighted on the right. 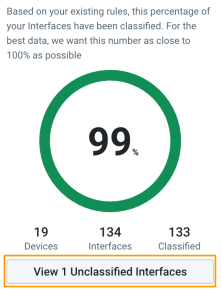 Clicking this will bring up the Unclassified Interfaces dialog like the one below that shows a list of all the interfaces in your account, by device, that have not matched one of your IC rules. Change your view type in the upper right-hand corner (above the chart) to Time Series Line Graph. In the Query pane of the sidebar click on the Advanced Options button to expand the additional options. 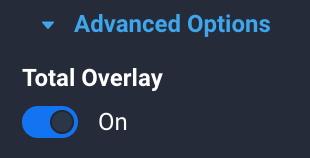 Enable the Total Overlay selector. Click Run Query at the top of the sidebar. Bracketing now supports up to two Group By Dimensions (for more information on Group By Dimensions see our KB article) where previously it was only available for Total (no Group By Dimensions selected). Static: user sets the threshold for each color manually. Percentages: the threshold for each color is set as a percentage of the sum of all lines in the returned data. Percentiles: the threshold for each color is set as the Nth percentile of the sum of all lines in the returned data. The Bracketing pane in the Data Explorer side panel is more compact and easier to read. Bracketing support has been added to both the Table and Matrix view types. Indicate which returned time-series scores the max value. The feature is now compatible with multi-metrics: the primary sorting one will be displayed as the big value, the others on the right side of the gauge. For more information on using Bracketing, head on over to our Bracketing Pane Setting article in the KB. Adding on to last month’s announcement of Multi-Metric, the user can now set a minimum threshold that must be reached for a data point to appear in a chart or table. 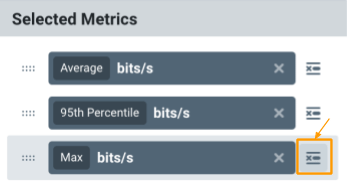 In the Metrics dialog (accessed by clicking on the Customize Metrics button in the query section of the Data Explorer sidebar), you will see a new button in the Selected Metrics selector which is highlighted in the graphic to the right. This will bring up a Set Minimum Threshold dialog. Once you have input the threshold minimum you want to see, the button in the Selected Metrics selector will change from grey to orange so you know a threshold is set. This is a common ad-hoc data filtering tool in the realm of BI tools, often referred to as a ‘Noise Suppressor’ because it will help weed out any background noise from the actual signal useful to the user.